Janis Clarke, president of Word for Life Rosary Mission travels to parishes and schools throughout North America, singing, speaking and inviting people to a life-changing encounter with Jesus Christ through the rosary. In collaboration with the Little Sisters of the Poor, Rosary Mission recently launched Youth&Aged for Life. This parish mission offers a unique approach to the rosary with meditations on the Scriptures, solos, congregational hymns and exposition of the Blessed Sacrament. It appeals to mind and heart, inviting parishioners to a life-changing encounter with Christ and a clear understanding of the basic Gospel Message. This living knowledge of Jesus and his teachings is key to a vibrant and mature faith that withstands the storms of life and longs to share the Good News with others! With singing, Scripture, stories, skits and the Rosary Janis encourages students to open their hearts to Jesus and let the Father’s love sink in, with the help of Blessed Mother. Janis invites the students to welcome the Holy Spirit and to discover that there is no greater adventure in life than following Jesus and His plan for their lives. 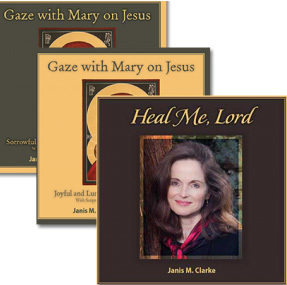 Gaze with Mary on Jesus Rosary CDs brings the Word of God alive through dramatic narration of the scriptures by Fr. Peter Ryan, SJ, and inspired music/chants by Janis Clarke. An accompanying music CD by Janis lifts hearts heavenward with love songs to the Father, Son and Holy Spirit. A Word for Life Rosary CD Set with music and songs by Janis Clarke and meditations by renowned scripture scholar Fr. Francis Martin is also available.